The good news is that one can save themselves and their families from falling prey to flu by a timely flu vaccine schedule. Please include attribution to https://abctravelclinic.ca with this graphic. Flu seasons in Toronto usually start as early as the end of November and as late as February. Therefore, mid-October through November is ideal to get a flu shot as the vaccine takes about two weeks to create antibodies against the flu. Why Should I Get My Flu Shot? A number of people believe that they don’t need a flu shot as they are healthy and will most not catch flu, this is, however, a misconception as the virus can affect anybody. It is also important to note that flu-related illnesses cause thousands of deaths every year across North America and getting vaccinated save lives especially those of the elderly (above 65 years of age) and infants, who are more susceptible of catching the virus. How Long Does The Flu Shot Last? It is recommended to get the flu shot every year as the vaccine is formulated differently depending on the virus and offers protection for only six months. Can I Get A Flu Shot While Pregnant? Pregnant women are advised to get a flu shot as it reduces their chances of catching the flu. They can also pass the vaccine through the placenta to the child thereby offering the infant immunity for up to 6 months after they are born. Although flu shots are relatively safe, one may experience soreness at the shot site and a low-grade fever and severe allergic reactions are very rare. If you have flu symptoms like fever, body ache, fatigue, and cough etc. 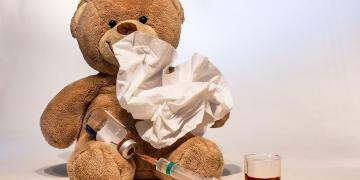 after getting the vaccine, then it is most likely that you contracted the virus before the shot was administered as the body tries to fight the virus for a couple of days before falling sick. Stay safe and healthy through the winter season – keep warm, drink your vitamins and find time to get vaccinated!